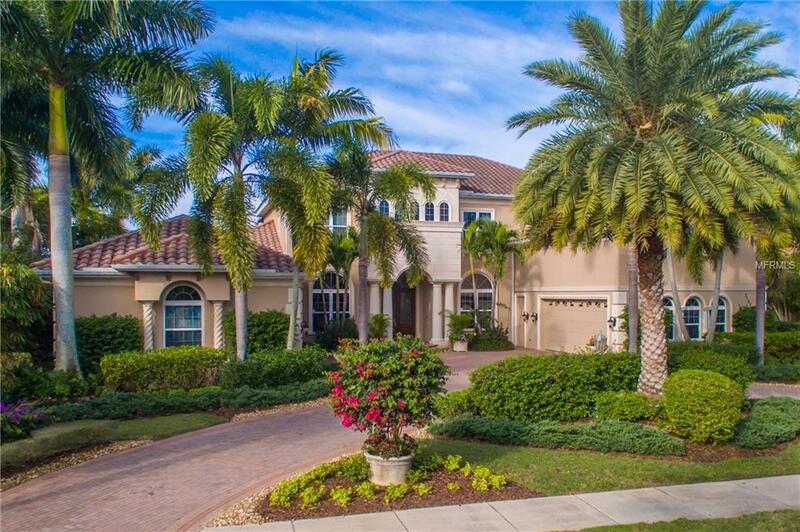 The Villa Del Mar Pruett Estate home, in the exclusive Teal Creek neighborhood on the 17th hole on Kings Dune, is inside the gated Lakewood Ranch Country Club. Once inside this exceptional home, the foyer leads you into the grand room, private study and dining room through 20 feet of sliding glass doors to the architecturally unique lanai. A columned passage showcases double arches into the inviting leisure room open to the chefs kitchen with European flavor, offering granite surfaces, custom cabinets, GE Monogram stainless steel appliances and a Dacor six-burner gas range. Transitioning into one of two master suites you find yourself in a lavish retreat some 30 feet in length. The palatial master bath is spanned by triple arches with views of a private courtyard. Making your way up to the extraordinary second level, there are three additional bedrooms with new carpeting, three additional baths and a second laundry room. Continue on to the home theater media room outfitted with recliner seating for seven and one of four wet bars throughout the home. The bonus room has space for game tables, ample seating and 20 feet of sliding glass doors extending this space out to a covered balcony overlooking the outdoor living space below. Once heading back downstairs and outside, soak up the sun and entertain guests around the curvaceous, saltwater pool and spa accented with a dazzling waterfall, an outdoor kitchen and a fireplace. For the connoisseur of luxury living! Additional Lease Restrictions Check With Hoa To Verify All Leasing Restrictions. Pet Restrictions Check With Hoa To Verify All Pet Restrictions.